The King Garden or Castle Garden was designed by Gilles Clement, well known for his planetary garden concept. 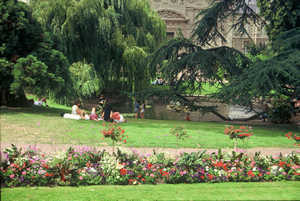 Three gardens represent the three different sides and dates of the Castle. The Simple garden relates to the Louis XII wing. The Central garden is linked to the Gaston d'Orléans wing and lastly the Royal Flowers Garden which expresses the François 1st wing.